Imarhan, meaning ‘the ones I care about’, began in 2008 – a loose collection of friends who began to play together under the watchful eye of Eyadou Ag Leche, bass guitarist of Tinariwen. Eyadou would go on to help them produce and co-write a handful of songs on their debut album. Imarhan have a sound that reflect their cultural and generational background; dry guitar riffs, pop melodies and panafrican rhythms which draw upon traditional Tuareg music, continental ballads and modern pop and rock they heard while growing up.The voice of a new generation, Imarhan create a rare symbiosis of the ancient and modern, channeling a rich and varied wave of musical influences from Algeria, Sub Saharan Africa and the West. 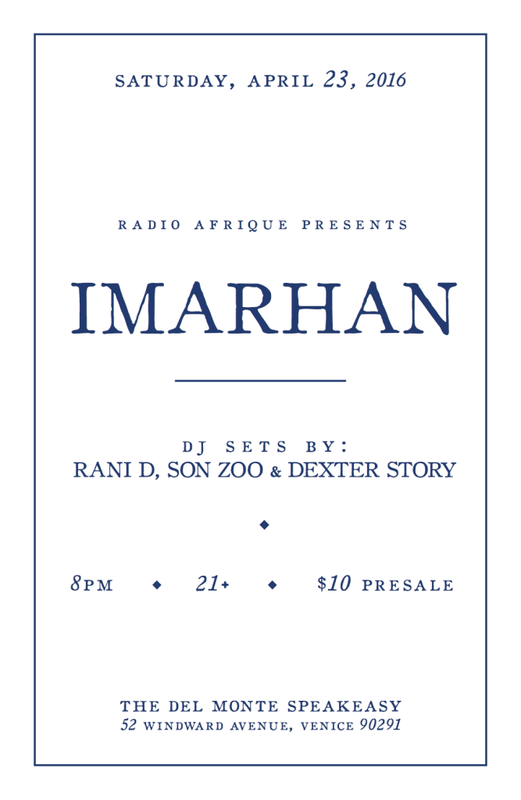 Please join us as we welcome Imarhan for their Los Angeles debut.